Ugni molinae. Chilean guava. Horticulture is not immune from trends. The 1980s witnessed gardens full of Centifolia roses and silver-leaved perennials, soon to be usurped by hot color schemes. Then acres of temperate hardwood landscapes were disfigured by the wave of tropical fever that overtook otherwise sensible souls. Why are gardening trends a bad thing? Because magnificent plants get thrown aside. First on the list of forgotten beauties is the Chilean guava. 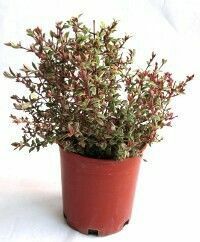 This lovely evergreen has shiny, fragrant foliage that tells you it's a member of the myrtle family. New growth is bronze and burgundy. But it's those tasty berries for which the Chilean guava is beloved. They make the best jelly in the world and you have Queen Victoria's word for it. They're small, no bigger than a blueberry, but the flavor, akin to taking a bite out of a Spring day, is so intense a larger fruit isn't necessary. You should see fruit the first year after planting, and deer seem to leave them alone. Chilean guava is a perfect choice for a hedge in suitable climates, such as the Pacific Northwest. Chilean guavas are slow-growing. Self-fertile, so you only need one plant to set fruit. Sun or light shade, great in containers, Chilean guavas provide a dignified presence to any landscape. 6' x 6.' Most soils, moderate water, hardy to about 15 degrees, Zones 8-9. Shipping is 35% to CA, 40% to OR,WA,AZ and NV,and 45% to rest of U.S. No shipping to AK,HI. Ugni molinae. Current crop as of September 2018 is about 18" tall, well-established, bushy, in 1 gal containers. Some fruit. Ugni molinae 'Flambeau.' The variegated form of Chilean guava. This cultivar grows at a very slow rate, so it's not for the gardener lacking a surfeit of patience. But the results are oh so worth the wait--the foliage is a mesmerizing collage of green, pink and creamy white tinged with red, and the red stems add to the visual pop. Same flowers and fruit as the species. Grown in 1 gal containers, plants are full and about 1.5' tall as of January 2019. Ugni molinae. These Chilean guavas are bushy, about 18" tall. No fruit or flowers as of June 2016. TEMPORARILY OUT OF STOCK. Olive Trees . Organic Herbal Wreaths . Fig Trees . Pomegranates . Jujube Trees. Chilean Guava . Japanese Sour Plum Tree. Japanese Pepper Tree.